PADI, diving and Instructor Development (IDC) around Thailand: The Royal Thai Naval Museum in Samut Prakan. 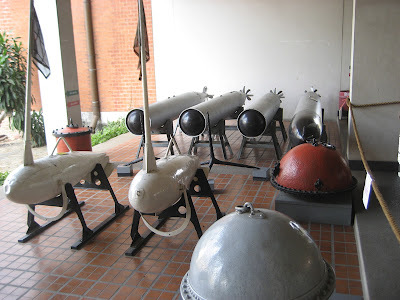 The Royal Thai Naval Museum in Samut Prakan. Yesterday my family and myself had a day's trip in Samut Prakan, a province and city next to Bangkok, direction Pattaya. 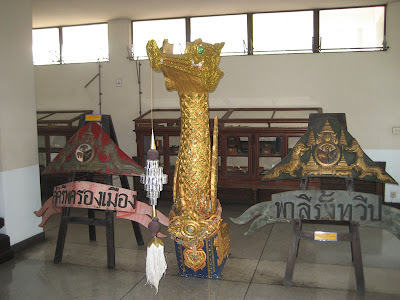 We visited a few other attractions, like the Erawan Musem and the Ancient City and on the way back to our hotel in Bangkok, we visited this Naval Museum. We were very fortunate since it was actually closed, but after a bit of taking to the guards, they decided to open up for us anyway and we had the whole place to ourselves. The day before it was Children's Day and yesterday was closed therefor. The guard went really out of his way opening all lights, shutters, windows for ventilation and even opening a couple of ground floor rooms so we could have a look. Diving wise there wasn't too much to be found, although these items above, torpedo's and mines sure made for something wrecks around the world. For a good Thai wreck web site have a look at Steve Burton's Thaiwreck website based in Pattaya or Jamie's MacLeod's Trident website based on Koh Tao, which is about tech diving but he found some very interesting wrecks in the Gulf. 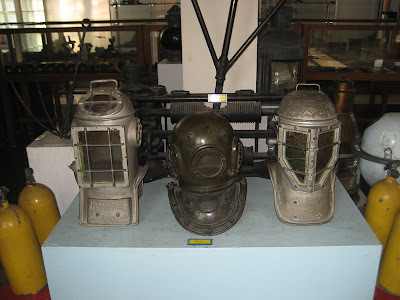 What was interesting about diving are these three dive helmets on display with some tanks next to them. Just looking at these helmets makes me start to sweat, man, that must've been hard work. 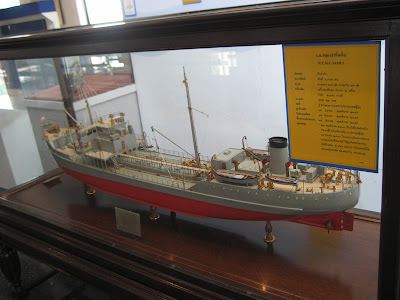 The museum had many ships on scale at display and one of the boats displayed, was the Samui, displayed here. I looked for the Kram and the Krut, two Thai landing crafts that have been purposefully sunk near Pattaya and on which I'm planning to go for the Instructor Wreck dive Specialty next month after the IDC but to no avail. One of the very interesting things that the museum had was a display of 18 scaled down in size boats that are part of the King's boats that once a year roam the Chao Praya river. There's a whole order in where all boats are located during their outings and in total 52 boats take part in the procession including about 1000 people who row the various boats. All in all, a very interesting museum and once you're in Bangkok, definitely worthwhile visiting. The admission was free by the way.